Which Ones Make Sense for Physicians? Whether you’re a resident or an attending physician with several years under your belt, you’ve observed firsthand how quickly life can change in an instant. And it’s not always life and death either – an accident or disease can occur anytime, creating an entire new set of circumstances. It would be great if we could go through life without having to concern ourselves with accidents or illnesses which could take us out of work. But unfortunately, there are no guarantees when it comes to our health, which is where disability insurance comes in. The fact you have a one in four chance of filing a disability claim before age 65 makes this especially true. In the case of physicians, not only are you in greater need of long-term disability insurance because of your higher-than-average income, but you need a policy which is tailored to your unique requirements you have for your profession in medicine. 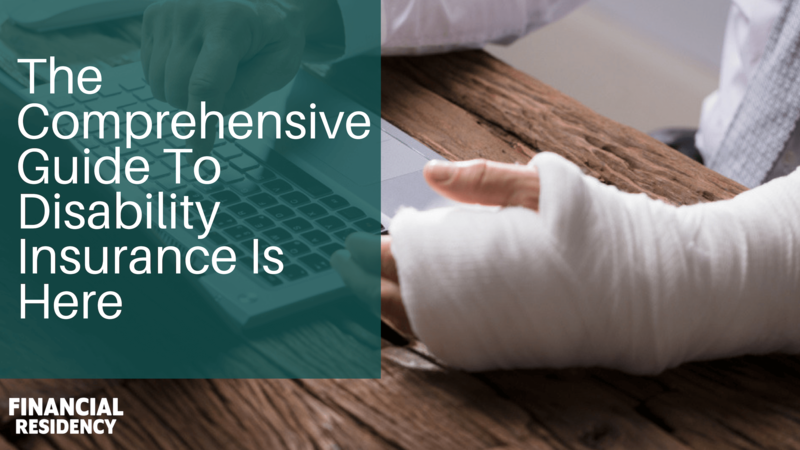 Your disability insurance policy – especially your long-term policy – needs to adequately cover your income and provide financial peace of mind should you be faced with a disability. You can achieve this adequate coverage by adding riders, which is another word for conditions, to your policy. If you’ve begun to conduct any research on this subject, you’ve probably realized there are multiple choices of riders and features available. How do you know which ones are necessary and which ones you could pass on? Are there riders which make more sense for physicians to add compared to others? Since you have to choose your riders and features when you first purchase your policy, we want you to be as informed as possible. It’s important for physicians to know which options make the most sense and which aren’t always necessary. When discussing riders, it’s also just as important to review the limitations and features of your policy. You need to pay close attention to the language and the way exclusions are written. We will discuss various examples and the categories you should have covered. Why are Riders Important for Physicians? At first glance, you may be tempted to overlook adding riders to your policy. If you’re on a strict budget as a resident, the thought of adding more to your policy is not extremely appealing. Truthfully, you should think of riders as a way to customize coverage and as a way to make your plan as comprehensive as possible. Riders are a way to insure you will be able to bring in an income even if you are unable to work. What may seem like a nonessential expense right now, could end up getting your family through an otherwise stressful time. Don’t think of riders to a disability policy as a “nice-to-have” but rather as a necessary component of building an overall strong financial plan. Which Riders Should Physicians Include? Before you can decide which riders you need to include, the very first step for you is to find an agent who is familiar with your needs as a physician. You’ll want someone who’s in tune with what’s occurring within the marketplace currently. Plus you’ll want to work with someone who has access to as many carriers as possible – this will allow you to receive the most competitive quotes. With this in mind, let’s start with the riders which are important for a physician to include in their policy. If you have questions about how these riders will impact your rates specifically, then be sure to discuss these specific ones with your insurance agent. A partial or residual disability rider is a must for physicians. A partial or residual disability rider is necessary to allow you to receive a payout even if you can still work, but not to the extent prior to your disability. Perhaps you are diagnosed with an illness which limits the number of hours you can work per week. You’re able to continue to work, but not for the length of time you could previously. This rider will allow you to receive a payout while working with your reduced schedule. If your pay is dependant on the number of patients you see per day, this could be tremendously important. When including this rider in your policy, you will want to understand the percentage of income loss which triggers the payout. It could be 15% or 20%, depending on the carrier. You’ll also want to look for whether or not you have to return to work within your specialty or if you can work within any occupation. You might also see this type of rider referred to as an Inflation rider. The reason for this is because your payout could be tied to Consumer Price Index, or rate of inflation. This rider allows your payout for your disability to be adjusted based on the CPI. One important note – the Consumer Price Index is not referring to the Cost of Living. This rider isn’t guaranteed protection against the increased cost of living. There are variations to the payout of the COLA. You can have your payout tied to the Consumer Price Index or you can have a fixed, flat percentage. If you do not have this particular rider in your policy, then your payout will remain the same stagnant amount whether you draw disability funds now or 25 years from now. This rider is important for those who are purchasing their policies in their 20s or 30s, even into their 40s. However, if you are in your 50s and still have this rider in your policy, you may find this to be an unnecessary addition. The future increase option is an attractive rider for those who are on a limited budget but still need disability insurance coverage. This rider gives you the option to purchase additional coverage once your budget has increased. If you are still in your residency program or fellowship, or an attending physician early in their career, then this rider is highly recommended. With this rider, your coverage (and therefore your premium) will increase annually or after a major life event. The idea behind this is your income is continually increasing and you will need to increase your coverage. The advantage to this is you will receive more coverage throughout the years, without having to undergo the underwriting process from the insurance carrier. In the insurance world, the younger you are then the easier it will be for you to receive the most competitive quote for a long-term disability policy. You will get the lowest premium possible when you’re younger and presumably healthier, like when you’re completing your residency. Even though your budget is tight, you can add the future increase option to add coverage once you’re earning your attending salary. Which Riders Should a Physician Consider for their Policy? There are a few riders which might not be 100% necessary for every physician to add to their policy but if you find yourself in these unique situations, it could be helpful to know these riders are available. With a catastrophic disability rider, you would receive up to 100% coverage if you were to become disabled to the point of not being able to complete 2 activities of living. Examples of these activities are bathing, feeding yourself, or complete vision or hearing loss. Keep in mind you could potentially receive up to 100% coverage whereas a normal long-term disability policy will usually provide coverage up to 60% of your salary. This rider is recommended if you’re in your 20’s or 30’s and you have almost your entire career ahead of you. However, if you are on a strict budget with limited with options or if you’re already mid-career, then you might be better off with other riders. The retirement protection rider is presented as a way to protect your retirement account should you be unable to contribute to your future savings during your time of disability. With this rider, if you find yourself drawing disability, funds will be set aside into a trust managed by the carrier. You would then access these retirement funds once you reach retirement age. One way to determine if you truly need the retirement protection rider is to ask yourself if you would be better off taking the funds to pay for this rider and adding it somewhere else. Perhaps your money would be better spent investing in a retirement account which also provides a tax advantage. No one likes to be told they can’t do something. But after reviewing all the riders which are available, a few are questionable and should be considered very carefully before you add to your premium to cover these. There’s one thing almost all physicians have in common – massive student loan debt. The student loan option capitalizes on this fact and has found a way to make it as an option for your policy. Though not technically a rider, this benefit would pay the reimbursement directly to the student loan holders should you become disabled. Since the average debt is easily six-figures for physicians, it could be tempting to want to add this feature to your policy. The first problem with this coverage is it’s usually only valid the first 10 or 15 years from the date your policy became effective. This time limit could severely limit the amount of time you qualify for reimbursement. But for physicians, there are better options. If you’re permanently disabled, you can apply to have your student loans discharged and you can get rid of the debt altogether. If you are partially disabled, you can apply for a deferment or forbearance and make payments at a later time. This rider is not ideal for physicians who have other options for loan repayment. As a physician, you will want to avoid any type of individual disability policy which uses the Any Occupation definition of disability. A definition of disability is how the insurance company defines the limits and benefits of your policy. This is a constricted definition which is typically used in group policies only. Basically, it states if you can work any type of job, whether it’s related to your degree or not, then you’ll be denied a disability payout. This can quickly become disadvantageous for you for example, if you can no longer perform surgeries but you are still able to work in any occupation. The Any Occupation language in your policy will only benefit the insurance company. With this definition, you could find yourself paying for a policy for years which may or not benefit you should you need to file a claim. Instead, you should choose a policy with the Own Occupation definition of disability. There are additional aspects for consideration with your disability policy. Your contract can have language written into it which isn’t necessarily considered a rider, but is a type of limitation to coverage or type of feature. When it comes to your disability insurance, the most important aspect of your policy is to make sure it includes the Own Occupation definition of disability.This type of policy allows you to receive a disability payout even if you are able to return to some capacity of work. Physicians will find this offers them the most amount of coverage and is the most liberal definition of disability. Typically your carrier will base your disability on whether or not you can perform the “material and substantial duties” of your specialty. Even if you are able to continue working in the medical field, under this definition, you could still be considered disabled and receive coverage. Within your policy, you want to make sure it is designated to be non-cancelable. This feature guarantees your premium will not increase on your policy, assuming you make your payments on time. Guaranteed Renewable is another feature you want to look for with your disability policy. This type of feature will guarantee you will be insured as long as you have paid the premiums on time. This feature does not protect the rate of the premiums but will insure you will continue to have coverage throughout the life of the policy. If you are a U.S. citizen then this particular language could be of importance to you. Many policies are written to cease disability payouts should you move outside of the United States. Some carriers, depending on which state you live in, would still allow you to receive a disability payout, even if you move to another country. While it may sound far-fetched to think of moving to another country, it’s worth your time to confirm the language in your policy. Is it possible you could marry someone who is from another country and choose to move to their homeland? Have you ever thought about the chance to work or volunteer abroad? Most people are unaware if the restrictions of foreign residency are written in, but this is an area you don’t want to be surprised with should you find yourself in this situation. Many people may falsely assume their long-term disability coverage doesn’t include any coverage for mental illness, nervous conditions, or substance abuse. In reality, you do have the option to include this type of coverage (in the form of a rider) to your policy. Some people may feel this rider is unnecessary because the payout is only 24 months, instead of paying out until the age of 65 like most others. Since mental illness or substance abuse have no age limitations, it’s worth considering if this is right for your policy. It’s estimated 10-15% of physicians will develop a substance abuse issue during some point of their career – this is a feature you should thoughtfully consider. When you are selecting the features you need for your disability policy, you will need to pay attention to the Elimination Period within your contract. This is the period of time which determines when you will receive your first disability payout. The rate for a 90 day Elimination Period is quite competitive, therefore most policies can easily accommodate this amount of time without adding an exorbitant amount to the policy. However, if you are looking for a way to decrease your premium, you could ask for a quote with a longer elimination period. Generally, the longer the time period, the lower your premium. Selecting which riders to include in your long-term disability policy doesn’t have to be a miserable experience. By reviewing these options before you meet with an insurance agent, you’ll have a better understanding of what you need for adequate coverage. One of the best choices you can make financially is to have a disability policy which carries you throughout your career. Sure, there are times where you could consider modifying or replacing your policy, but starting out with the correct riders tailored to your unique medical career is one of the best decisions you can make. Are you interested in learning more about creating a comprehensive long-term disability policy? Check out the Comprehensive Guide to Disability Insurance or subscribe to the podcast for more information on your options.